Daebak drama will be airing on the 28th March 2016. This post is part of TEF Blog activity to promote the drama. We would like eels and viewers to understand each of the drama character. Today we will discuss about King YoungJo, half brother of Daegil and will eventually encounter with him in gambling table. 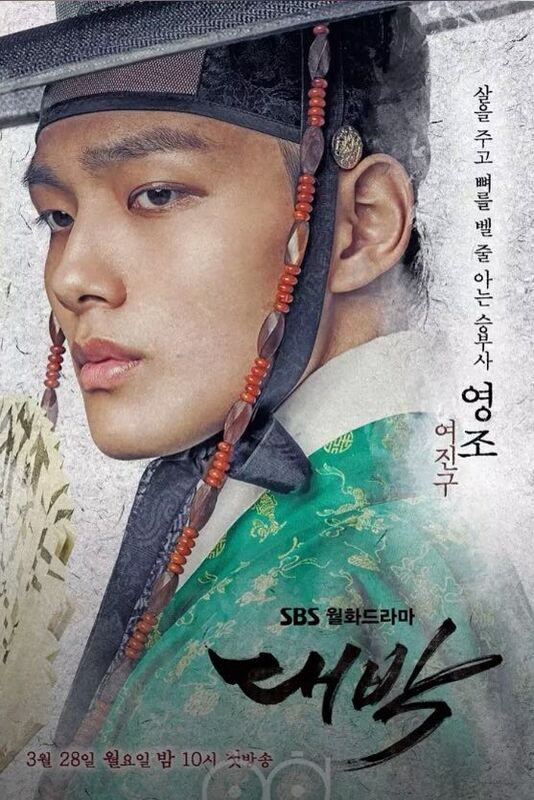 So far, we’ve had a look at Dae-Gil, the tossed away Prince Yeongsu, and the Mother of the two Princes, Choi Suk Bin. But what about Yeongjo, the prince who became King? The Soron faction put Gyeonjong on the throne, but because Gyeongjong did not have any sons to succeed him, the Noron faction supported the appointment of his half brother as Crown Prince. The Soron faction oppressed the Noron faction fiercely, and Yeoning-gun himself rendered his resignation as Crown Prince on several occasions without success. After Gyeongjong passed away, confrontation between Soron and Noron factions reached an extreme degree of tension because the Soron faction spread a rumor that the Noron faction poisoned Gyeongjong. Yeongjo ascended to the throne under these circumstances and executed the Policy of Impartiality (tangpyeong) to end the vicious cycle of endless revenge and attempted to establish a coalition government based on moderate members of both factions who supported the policy. The Policy of Impartiality advocated by Yeongjo put the Noron faction that support him to the throne as the mainstream and had the Soron and Namin Factions participate on the side. But let’s step back a few years. In spite of having his life under constant threat from the opposing Soron faction, Yeongjo was raised by both a loving mother and doting father. In fact, Sukjong spent lavishly on the young prince. However, because Yeongo’s mother was a low-born concubine, all the officials, who were born in noble houses and had noble wives, maintained a condescending view of the Prince and his mother. They were quick to lecture Sukjong on frugality and modesty. The King ignored them. As an example of Sukjong’s lavish spending, he celebrated the wedding of Prince Yeoning in 1704 with a grand and lavish party. Again, the ministries complained about the excessive favoritism the King showed to the Prince. And again, they were ignored. But Yeongjo did not grow up as a typical spoiled, self-indulgent princeling. In fact, Yeongjo was known to be a child prodigy who became one of the greatest kings in Joseon history. People around him described him as an articulate, bright, benevolent and kind King. He was penetrating in observation and quick of comprehension. In addition, he was a deeply Confucian monarch. He was said to have had a greater knowledge of the classics than his officials. In 1703, Queen Inwon adopted Prince Yeoning, who was known to be her favorite and whom she regarded as her own son. This adoption, while a common procedure to give increased legitimacy to an heir, brought about another bloody factional dispute that the opposing Soron faction lost. Years later, on his deathbed, King Sukjong supposedly expressed his order that Yeongjo officially be named Gyeongjong’s heir. However, in the absence of a historiographer or recorder, the Soron faction denied Yeongjo that elevated position, and King Gyeonjong never named him as such. Nevertheless, four months after Gyeongjong ascended the throne, Yeongjo was installed as Royal Prince Successor Brother (wangseje) to handle state affairs, since the king’s weak health made impossible for him to manage politics. His fragile health left him with no energy or time to do anything significant in the four years of his reign. Instead, Yeongjo took over the required governmental duties of his half brother. Was Yeongjo really a Gambler? In the drama, Daebak the Royal Gambler, our young Royal Prince appears quite familiar with gambling houses and gaesang establishments…and enjoys partying. He gambles. He flirts. He laughs and plays and, finally, risks his kingdom in a game of chance. But what is the historical truth? By the time he was a young adult, Yeongjo had already escaped numerous threats to his life. More than once he had been accused of attempted treason and assassination attempts. Fortunately, his father and step-mother, Queen Inwon, often intervened to protect him and expose the plots against him. So, he was quite familiar with taking risks and gambling that he would survive. For example, when the Soron faction failed to prevent Prince Yeoning from being named Royal Prince Successor Brother, members of that faction then came up with an idea to assassinate Yeoning under the cover of hunting for a white fox, said to be haunting the palace. Yeoning, however, became aware of the plot and sought shelter with his step-mother, Queen Dowager Inwon, who protected him. After that event he said to King Gyeongong that he rather would go and live as a commoner. In fact, several times over the four years of Gyeongjong’s reign, he requested permission to step down but was denied each time. Each time, he strategically gambled that his request would be denied. It’s also quite true that Yeongjo was well known for leaving the palace incognito to walk among the people and visit the markets. He began this habit of walking amongst the people as a young prince. So, it’s probable he knew about the gambling houses and gaesang establishments. But did he visit them? Considering that gambling was illegal, players had to be wary of strangers and continually change their games of chance or invent new ones to avoid being caught gambling. Would the young Prince have taken those risks? Not likely…but you never know with this exceptional Prince. During the reign of Yeongjo and his grandson Jeongjo, Confucianism was at its height, as well as the economic recovery from the wars of the late 16th and early 17th centuries. Yeongjo, realizing the detrimental effect on state administration of factional strife during the latter half of the 17th century, attempted to end factional strife as soon as he ascended the throne. Unlike King Sukjong who used factional strife to pull power away from his nobles and ministers and, thus, increase the authority of the King, Yeongjo sought to end it through a policy known as the "Magnificent Harmony" (Tangpyeong) or Policy of Impartiality, as noted above. Yeongjo worried deeply for his people, even to the point of worrying that rain would ruin the harvest and forcing his unfortunate people to starve. As a result, the King ordered his courtiers to reduce taxes on the people and decrease the number of dishes in his own meals. Reducing the range of foods he ate was a decision made out of concern for his starving people. Yeongjo's concern for improvement of the peasant’s life was manifest in his eagerness to educate the people by distributing important books in the Korean script (Hangul), including the Book of Agriculture. The pluviometre was again manufactured in quantity and distributed to local administration offices and extensive public work projects were undertaken. Yeongjo also upgraded the status of posterity of the commoners, opening another possibility for upward social mobility and inevitable change. Yeongjo policies were intended to reassert the Confucian monarchy and a humanistic rule, but they couldn't stem the tide of social change that resulted. Yeongjo's reign lasted 52 years and was marked by his persistent efforts to reform the taxation system of Joseon, rule by Confucian ethics, and minimize or reconcile the factional fighting. In fact, his reign is considered one of the most brilliant in Joseon history.